For our Green Light brake pads, we have carefully selected the best brake component manufacturers who deliver the best quality and increase their presence and cooperation with vehicle manufacturers each year, and who are proven OEM suppliers. Thus, Green Light brake pads manufacturers are in tune with the latest requirements of car makers, invest into improvements of production processes, and above all use the right tools to constantly control the quality of their brake pads. One highly important aspect regarding quality control of our brake pads is that our manufacturers have the right equipment by German, Japanese and South Korean manufacturers, which allows them to conduct 160 different test procedures, and to test the product under simulated extreme operating conditions. The tests include purity, material density, and friction material performance in contact with substances that could potentially come into contact with the brake pad during operation, such as greases, solid dust particles, fumes etc. High production capacity of our suppliers allowed us to create for our customers a range of the most sought-after products for the European market. Hence, our offer includes 650 different brake pads for personal and light delivery vehicles, which affords 91-percent coverage of the vehicle fleet in this segment. In particular, our offer is concentrated on vehicles that are 4 to 16 years old. We are aware that braking distance is of key importance for safe driving. 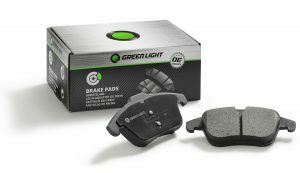 Therefore, Green Light brake pads are made of friction materials that afford maximum braking performance and quiet, comfortable, and stable braking. Green Light brake pads are copper-free, which helps preserve our environment, especially our waters. Namely, with brake pads that contain copper, copper particles – especially in urban areas where braking is more frequent – are released into the atmosphere and subsequently deposited on the soil, seeping in time into groundwater. Green Light brake pads are made according to European standards, which is also certified with the ECE R90 certificates awarded to them. Also supplied with our brake pads are the wear sensors and screws for installation onto the brake callipers in applications where their replacement is urgent. Just like with brake pads, the range of brake disc suppliers includes select specialized manufacturers with years of experience, all of whom are long-standing OEM suppliers. We have selected manufacturers who manage their own steel and iron foundries, which allows them to control the quality of raw material before the products are actually made; who have automated production; who have the best possible equipment for disc balancing and treatment; and who manage their own research and development, and quality control departments. Their CNAS certificates also attest to their ability to test the quality or brake discs for other manufacturers and customers. Moreover, they have been awarded the training and education license for the foundry operations, and thus they also care for constant training and education of their own employees in the field. 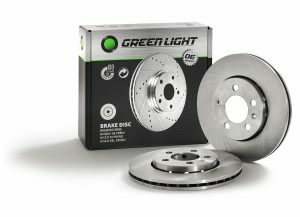 Green Light’s offer includes over 462 different brake discs for personal and light delivery vehicles, which affords 90-percent coverage of the vehicle fleet in this segment. Our offer is concentrated on vehicles that are 4 to 16 years old. Our brake discs are made of light grey iron composite, and they are highly resistant to excessive heating. Discs are packed in durable packaging that decreases the threat of transport damage; moreover, a pair of discs also includes additional screws and mounting instructions. Green Light brake discs are made according to European standards, which is also certified with the ECE R90 certificates awarded to them. In the near future, our offer of discs will be expanded with high-carbon brake discs coated with geometric protection. Select Green Light filter manufacturers allow establishing a quality offer for the European market. They are also the largest OEM supplier in Finland, and they develop products for that market, which can withstand extremely low temperatures. 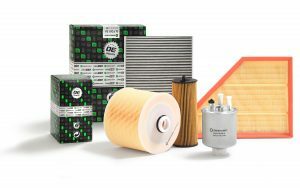 Green Light’s offer includes over 680 different filters: air, oil, fuel, and cabin air filters. The latter also include versions with active carbon that purifies the air entering the cabin, making it less harmful, eliminating any odours, and above all decreasing the probability of lung disease and allergy resulting from inhalation of polluted air. Green light active carbon filters can be identified by the ending in the catalogue number, as they are labelled with the letter “C”. Green Light air filters are made of high-quality paper by German manufacturers. It should be noted that paper quality is a key element in production of air and cabin air filters, which affects the quality of the product. Poor filtering quality leaves soot and dust particles in the air that in turn causes engine failures and damage to the vehicle. Advanced dust removal technology and optimum operation of the Green Light filters ensures the vehicle operates completely reliable during the service interval. As for air filters, Green Light fuel filters also reliably protect the engine from contamination with impure fuel or water. Oil filters and certain types of fuel filters are made by an innovative method of instant welding (30–100 s), without pollution under high pressure, which allows considerably higher durability of the welded joints, we well as better welding accuracy. Production processes are highly automated and production takes place in areas in which a constant low temperature is maintained. Thus, the materials used do not change their properties in the course of the manufacturing process. Manufacturing processes of all our manufacturers are managed in accordance with the ISO TS16949 and 14001 standards. All manufactured filters pass 100% 13 control points, using machine technology specified by OEM. This reliably ensures that the quality of Green Light filters is equivalent to that of the OE products. It should also be noted that the Green Light filters are made to requirements and dimensions of vehicle manufacturers and original filters, and that they ensure a perfect fit and easy replacement. Owing to high production capacity of our manufacturers, Green Light’s offer includes 834 different shock absorbers to cover 94% of European vehicle fleet. In particular, our offer includes shock absorbers for vehicles older than 6 years. Our suppliers take part in product development for OEM. Employing high-tech equipment (3D scanning, performance at low and high temperatures, high speed), they can develop shock absorbers for any vehicle at their development centres. They have an excellently managed and predominantly automated production process, with the TS16949 certificate to stand witness to its quality. Our offer of shock absorbers includes hydraulic (oil) and gas-charged shock absorbers of virtually all types (twin-tube, mono-tube, with a cup etc.). The type of Green Light shock absorber can be determined based on the ending in the catalogue number: the ending “G” (as in gas) indicates gas-charged shock absorbers, and the ending “O” (as in oil) indicates hydraulic (oil) shock absorbers. Our manufacturers use superior components for the Green Light shock absorbers, especially in hydraulic absorbers where the quality of the seal (or gasket) and the composition of oil are very important. Thus, Green Light shock absorbers use the globally renowned NOK seals with durability of over 2,000,000 cycles, and the oil type HIRI 281 SV-3 that was officially approved by Volkswagen for the Asian market and which allows excellent operation and viscosity at temperatures ranging from -30 °C to +80 °C. Although the shock absorbers are packed in boxes containing one item each, we recommend our customers to purchase them in pairs, since safety guidelines require replacement of shock absorbers on both vehicle axles. Green Light shock absorbers come with a warranty lasting 24 months or 100,000 kilometres travelled from the day of installation. 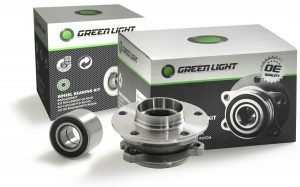 Green Light’s offer includes 366 wheel bearings for vehicles older than 5 years, which covers 85% of the European vehicle fleet. Wheel bearing quality is equivalent to that of the OE. Our offer includes plain bearings of the 1st, 2nd, and 3rd generation, and integrated bearings with a hub and ABS magnetic encoder ring mostly required by newer vehicle types and upmarket vehicles. Also supplied in Green Light boxes are additional screws, seals or gaskets, clamps, and nuts for assembly. Moreover, bearings with magnetic encoders are additionally protected by a plastic cap that protects the magnetic encoder ring from damage when the bearing is placed on metal surfaces. Manufacturers of our wheel bearings manage their production pursuant to the ISO TS16949 standard, and they are the leading manufacturers and suppliers for globally renowned brands in the after-market segment. Consistently with the Green Light strategy and vision, we selected the constant-velocity joint suppliers whose production is managed in accordance with the standards ISO TS16949, ISO 14001, and OHSAS 18001, and who also take part in the first build or who are OEM and OES suppliers, especially in North America and Asia. Green Light’s offer includes 283 different inner and outer massively machined constant-velocity joints. 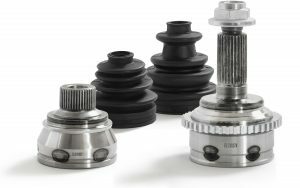 All constant-velocity joints are new and treated with machines that allow quality surface quenching or tempering of the rotating surfaces. Also supplied in Green Light boxes are all elements required for quality replacement, including the boot, clamps, and grease. The boot is made of high-quality stretchable neoprene rubber. Unlike the boots made of nitrile or blow-moulded plastics, they are not flammable, they are much more durable and elastic at low temperatures, and they do not break until –40 °C. With normal use, the useful life of neoprene can be more than 10 years, which means good protection of constant velocity joints and drive shafts. 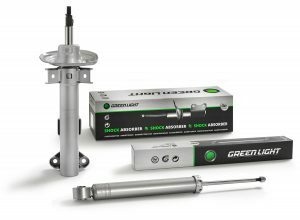 Green Light’s offer includes 111 different axle half shafts. Green Light constant velocity axle half shafts are exclusively new, and made in the same factories as our constant velocity joints. Our manufacturers have over 20 years of experience with axle half shaft production. Every half shaft is quality hand-made and assembled using the same components and elements as for the constant velocity joints. Therefore, our axle half-shaft comes with a 24-month warranty. It is also better priced than a new drive shaft, and it is an environmentally friendly product. For ignition coils, we have selected a leading and specialized Asian ignition coil manufacturer with a strong presence as an OEM supplier, offering a broad range of products and who can use high-tech machinery to make both the simple and the most complex ignition coils for the latest personal vehicle models. As a result, Green Light’s offer affords excellent coverage of European and Asian vehicles with as many as 270 different items. Green Light ignition coils are manufactured at plants organized in accordance with the ISO TS16949 standard. durability test at high temperatures between 125~140 °C for up to 500 hours.